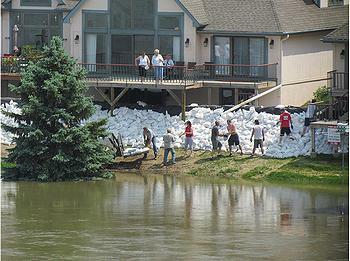 OMAHA, Nebraska, June 6, 2011 (ENS) – Releases from six Missouri River reservoirs, already at historic levels, will be increased again this month, say water managers with the U.S. Army Corps of Engineers. Reservoir storage is now near capacity after a year’s worth of rain fell in the Upper Missouri River Basin during the past few weeks. In addition, snowpacks measured at 140 percent of normal in Montana, northern Wyoming and the western Dakotas are melting, contributing to unprecedented runoff to the Missouri River and its tributaries. Water managers expect significant flooding in cities, towns and agricultural land along the Missouri River in North and South Dakota. Many stretches of the river from Sioux City, Iowa to the Mississippi River will rise above flood stage. On June 1, for the first time in history, the Corps raised spillway gates at Garrison Dam in central North Dakota to relieve a massive amount of water in Lake Sakakawea behind the dam. The gates will gradually be raised to increase the flow. 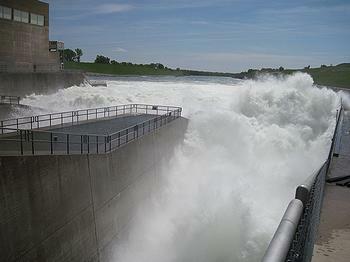 By mid-June, the release systems will be sending 150,000 cfs into the Missouri River. Flows from five of the Missouri’s six reservoirs are expected to reach a record 150,000 cubic feet per second, cfs, by no later than mid-June, and will remain at that level well into July, or possibly longer. “We’re releasing more water than we’ve ever released before,” said Kevin Grode, Missouri Basin Reservoir Regulation Team leader, with the Corps’ Water Management Office. Grode said the Corps updates its calculations of reservoir storage space on a daily basis. High volume releases will continue at least thru mid-August, Grode said. Flooded areas are expected to be inundated for several months, warn weather and water scientists. People living along the river are encouraged to make evacuation plans now to protect their possessions and property. Maps for potential flood areas can be found at: www.nwo.usace.army.mil. Residents in communities along the river are encouraged to contact their local emergency management offices for more details. “State and local emergency management teams will be the point of contact for residents needing information about flooding in their area,” said Kim Thomas, chief of the Emergency Management Office. In North Dakota, Governor Jack Dalrymple has activated the National Guard. 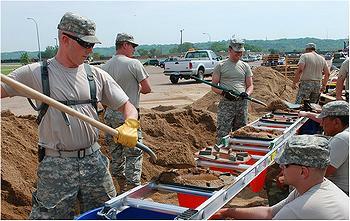 More than 1,100 National Guard members are on duty assisting with flooding operations in the Bismarck-Mandan area. Governor Dalrymple said Friday that the Corps has agreed to assist the Standing Rock Sioux Tribe with the construction of temporary measures to protect the community of Fort Yates from the rising Missouri River waters. A key area of concern for the tribe is keeping the main road into Fort Yates open. Engineers determined that waves are going to top the causeway, resulting in possible erosion of the riprap. The Corps has agreed to raise the riprap elevation on both sides of the causeway to ensure the main artery into the community remains open. The Corps also will provide flood mitigation measures to protect the Sitting Bull monument and the Fort Yates water intake, a main source of water for the community. A federal emergency declaration aproved by President Barack Obama lists 21 counties and two Indian reservations throughout North Dakota, where residents are dealing with the aftermath of flooding or are in various stages of fighting flood waters. “Immediate federal assistance is critical, especially now that there will be increases in water releases from the Garrison Dam and sooner that previously announced,” said Governor Dalrymple. In South Dakota, Governor Dennis Daugaard says state, local and federal governments are “working feverishly” to put measures in place that will protect the public infrastructure, such as roads, utilities and emergency transportation. He cautioned those in flood areas to continue efforts to protect their property. 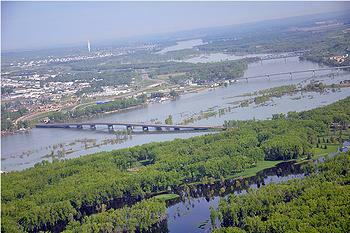 At the South Dakota state capital of Pierre, the Missouri River is forecast to crest in mid-June. Corps officials have confirmed that the emergency levees will be heightened to contain river levels of 1,436 feet above sea level. The Corps believes that levees at that level will be high enough to protect Pierre and Ft. Pierre from flooding even after the flow increases to 150,000 cfs in mid-June. Grode told reporters on the teleconference today that another levee breach like the one that occurred Sunday near Hamburg, Iowa is “definitely likely.” Voluntary evacuations are occurring in Hamburg; some 600 people have left their homes. The Corps is monitoring all the levees throughout the system, Grode said, noting that this levee breach follows weeks of high flows and record releases from the main stem dams in Montana and the Dakotas. In Montana, Governor Brian Schweitzer has declared a state of emergency and requested that the President issue a major disaster declaration due to widespread flooding. “Previously saturated soils, rapid melting of record snowfalls in addition to record or near record rainfall has caused significant damage to local and tribal roadways, bridges, flood control dikes and other public infrastructure in addition to misplacing hundreds of citizens,” Schweitzer wrote in his request letter to Obama on June 1. Farther south, the Missouri River continues to rise in northeastern and eastern Nebraska due to recent rains and releases from Gavins Point Dam. There are 300 homes near the flooded areas. The North Platte River in western Nebraska is currently at major flood stage. The rising river has forced the Omaha Tribe of Nebraska to shutter its Casino Omaha. In Sioux City, Iowa, rising waters have already inundated lands close to the river, and city officials have warned residents that roads may be closed due to flooding. CF Industries has halted production at its Port Neal nitrogen complex as a “precautionary measure until the impact of rising water levels is known.” The plant produces more than a million tons of nitrogen products annually for agricultural and industrial customers. The Iowa Department of Natural Resources closed Lewis and Clark State Park as of today. The rising water table in the area will cause the park to flood around June 10 and is not expected to recede for close to eight weeks. High water will cut off the park road and infiltrate the park facilities, officials said. The record runoff and rain the Upper Missouri River Basin will be felt all the way down to its junction with the Mississippi River near St. Louis and on down the Mississippi to the Gulf of Mexico. Mississippi River flooding earlier in the spring has now subsided due to the opening of the Bonnet Carre Spillway which currently has 330 of 350 bays open, and the Morganza Floodway which currently has seven of 125 bays open. 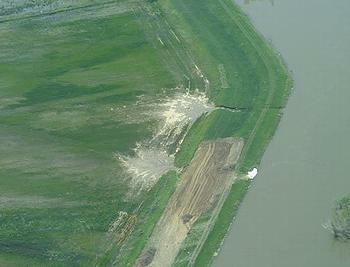 The Morganza Floodway is projected to close on June 7. The Bonnet Carre is remaining open through at least the end of the month based upon current levels in the system, water managers say.